AirSource members - Can you believe it, that time of year has arrived again; GET READY to participate in the annual "Home for the Holidays" event! 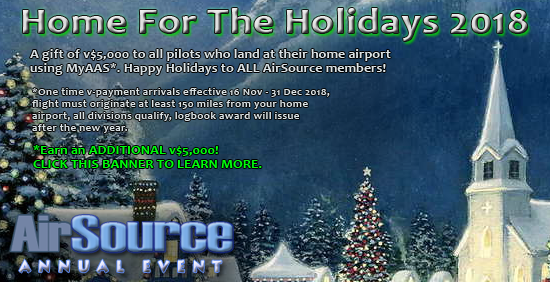 A gift of v$5,000 to all pilots who land at their home airport using MyAAS. Happy Holidays to ALL AirSource members! One time v-payment for arrivals to your HOME AIRPORT; effective 16 Nov - 31 Dec 2018, flight must originate at least 150 miles from your home airport (*LAST LEG OF FLIGHT must originate at least 150 miles from your home airport if performing the BONUS FLIGHTS), all divisions qualify, logbook award will issue after the new year. EARN ADDITIONAL AWARD AND $V! NOTE: No other flights can be flown between 1,2 or 3 (must be consecutive). *ALL FLIGHTS must originate at least 150 miles from your home airport. Only pilots hired BEFORE 16 Nov 2018 are eligible. DO NOT change your home airport after 16 Nov 2018! All pilot data will be "frozen" and downloaded as of 00:00 UTC 16 Nov 2018. The home airport you had at that time will be used to determine your eligibility for this event. HOW TO ADD OR CHANGE YOUR HOME AIRPORT? [THIS IS NOT APPLICABLE NOW THAT THE EVENT HAS STARTED] You can add or change your home airport by going to PILOT OPERATIONS, then click on the AIRPORTS link (2nd row all the way to right), then SEARCH for your home airport. Once the airport page comes up, simply CLICK on the link on the top left portion of the airport data area (the link is called "Set as my Home Airport". That's it! But be sure to do add or change your home airport before 16 November! Enjoy - and Happy Holidays! Re: Home for the Holidays 2018! I liked "Home for the Holidays 2018" so much the first time that I will do it again! And Thanks a lot, man! So glad to hear that Don! Merry Christmas! Happy New Year! All HFTH 2018 awards have been issued, thank you for participating in this fun annual event! Hi guys my badge for home for the holidays has appeared (thank you) is there going to be an additional badge like before? for completing the challenge set out? paul01942 wrote: Hi guys my badge for home for the holidays has appeared (thank you) is there going to be an additional badge like before? for completing the challenge set out? Unfortunately the LSZM-EGPH was the flight that did not register (as they need to be consecutive depart/arrive as well); the scheduled flight should have been LFSB-EGPH. I can still manually award the bonus though, if you wish? No problem Paul, completely understand and since these two airports are very close (0.4 NM!) I went ahead and submitted the award. In fact I think I'll need to remove one of these as they are indeed the same airport!